If you missed submitting a name for this shirt, we have started collecting names for the next project. Please click here or on the button below to submit your child’s name for the 2016 ICCD shirt. We collect names on a per project basis and do not carry names over from project to project. If your child’s name is on the 2015 Go Gold® Shirt or previous shirts, but you would like their name to be on the 2016 ICCD shirt, please submit their name again using this link or the button below. We want to thank everyone who submitted a name and thank each of you for purchasing a shirt to help raise awareness during Childhood Cancer Awareness Month in September. The proceeds from this purchase will go towards providing quality free resources designed for children and families who are fighting or have fought childhood cancer, to coordinating local assistance and to leading national and international advocacy campaigns for greater awareness and more research. To learn more about ACCO and what we do, please visit our Home Page. 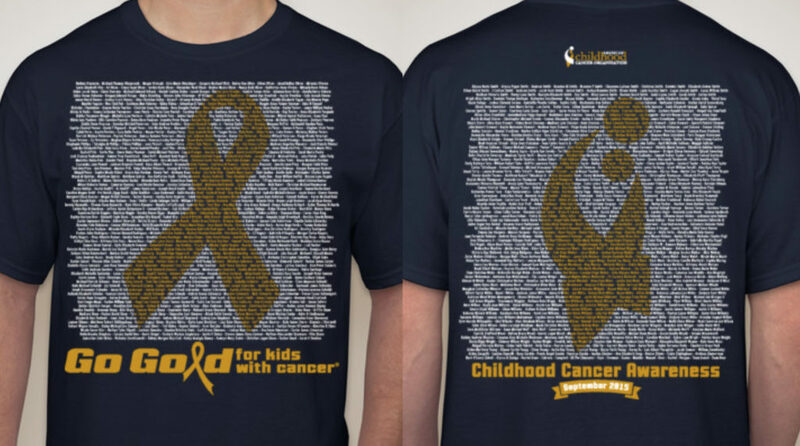 We were truly honored to share our 2015 ACCO Go Gold® Shirts featuring the names of over 3,400 children and teens who have fought or are still fighting childhood cancer. The thousands of names on these special shirts represent so much more, they represent someone’s child, brother, sister, cousin or friend. They represent too many children, teens and families who have fought this disease with fierce strength and determination. The American Childhood Cancer Organization vows to stand with our children, teens and families until there is a change, until there are better treatments and one day a cure! Since we received over 3,400 names we have to divide them onto three different shirts. When ordering the shirts please be absolutely certain you are selecting the correct shirt. Please click here to view the final list, use the button below or view the entire list by scrolling down. Names are in alphabetical order by last name. If no last name was submitted, first names are in alphabetical order on the end of the list or last shirt (SHIRT 3). For siblings, cousins or friends, the names have been placed together in order to print on one shirt upon special request. This list is final and no further corrections can be submitted. Due to the amount of names received, we are unable to include punctuation such as quotations.